Slavery, The Constitution, Parental Rights, Thomas Jefferson, on Foundations of Freedom Thursday: It's Foundations of Freedom Thursday, a special day of the week where we get to answer questions from you, the listeners! Always answering your questions from Constitutional principles! Tune in today as we answer your questions such as amending the Constitution, parental rights, Thomas Jefferson, slavery, and so much more, right here on WallBuilders Live!! Can a Coach Pray with His Players? Coach John Small, Football Games, Prayer Movement and Seeing How God is Working in the Midst of Attacks on Our First Amendment Rights: The WallBuilders team interviews Coach John Small regarding his recent pressure from the Freedom From Religion Foundation over his participation in the students praying before their football games. The WallBuilders team also discusses how this ties into our First Amendment rights and why we can have hope for the future. Is It God's Will That We Protect Ourselves? The Biblical View Of Self-Defense Today we are interviewing Rodney Howard-Browne on the Biblical view of self-defense. Tune in now to learn more. What Is The Role Of Christmas In The Story Of America? What Is The Role Of Christmas In The Story Of America: We have two amazing guests on with us today! Ray Comfort will be on talking about his new Christmas movie. Then we will have Rob Chambers on from the American Association on talking about the Naughty and Nice List for this year! Why is all of this so important? Culturally, does it really matter whether we emphasize Christmas? What is the role of Christmas in the story of America? Tune in now to find out! Guns, Science, Free Speech, and More on Good News Friday! Guns, Science,Free Speech, and More on Good News Friday: Good News Friday today on WallBuilders Live! Tune in now to hear about just some of the good things that have been happening in our country recently. In this episode, we discuss things such as, science and the Bible, Christians and guns, free speech on campus, blocking physician assisted suicide, and more! Thanksgiving Special On TBN With David and Tim! Myths About The Pilgrims And The Real Reason For Their Voyage! Happy Thanksgiving From WallBuilders! Myths About The Pilgrims, A Thanksgiving Special: We have a lot to be thankful for! Today, we will be covering myths about the Pilgrims! Many people don’t know much about the Pilgrims, much less know the truths about them. Tune in now to learn more! Dispelling Lies About Israeli Forces- What is the Truth About Israel? Interview With Amit Deri: Israeli Special Forces do ideological battle on U.S. college campuses. Today we are interviewing Amit Deri who uncovers the lies and propaganda. Tune in now to learn more!re! Is The National Anthem Racist? The Truth Behind Francis Scott Key and Our National Anthem, With Shelli Manuel: The WallBuilders team talks with Dr. Shelli Manuel today about Francis Scott Key and our national anthem. They discuss the misrepresentations of both Francis Scott Key and the time surrounding the writing of our national anthem. We learn that, instead of being racist, they are really quite the opposite. One Blood - Don’t Let Racism Divide. Biblical View Of Race With Pastor Jeff Klingenberg. The WallBuilders team interviews Pastor Jeff Klingberg about his views on racism and the importance of not letting it divide us. Pastor Jeff Klingberg specifically talks about how racism should not characterize us as Christians, some things we can do to help fight and guard against it, and also shares some valuable lessons his father taught him on the subject. Intervening For Christians in the Middle East and Standing With Courage and Making a Difference Around the World, Good News Friday! Intervening For Christians in the Middle East and Standing With Courage and Making a Difference Around the World, Good News Friday today on WallBuilders Live! In this episode, we discuss things such as, how people are speaking out with courage and having a voice - whether it be a homeschool mom contacting a publishing company regarding a foundational mistake or a retired chaplain publishing a Christian stance in the Air Force publication, Stars and Stripes, and more! Also, learn how President Trump is making a difference in the Middle East and on the abortion front as well. Court Upholds Indiana Law Banning Sales of Aborted Baby Parts! Good News Friday! Was The American Revolution An Act Of Terrorism? Foundations Of Freedom Thursday! An Overview Of The Constitution! Constitution Alive Part Three! Where’s the best place to research which vaccines contain any of these? 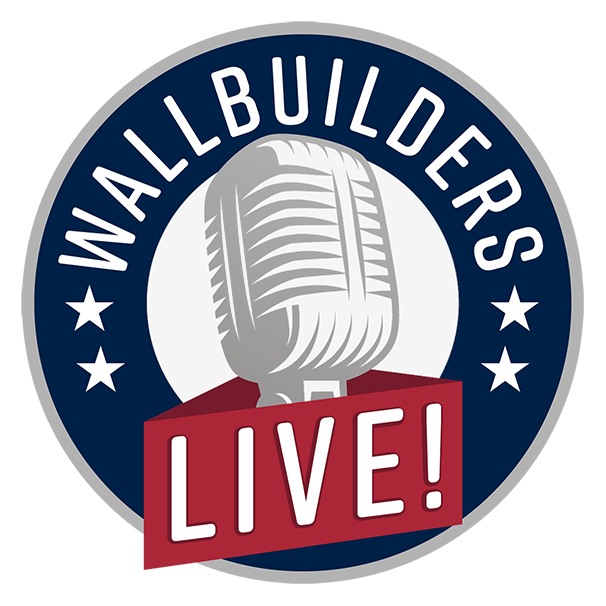 WALLBUILDERS LIVE! with David Barton, Tim Barton and Rick Green is a daily journey into the past to capture the ideas of the Founding Fathers of America and then apply them to the major issues of today. Featured guests will include Congressmen, Senators, and other elected officials, as well as experts, activists, authors, and commentators on a variety of issues facing America. Thank for visiting wallbuilderslive.com. In efforts to comply with the new GDPR regulations we have created a Privacy Center for your convenience.